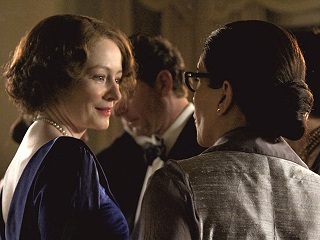 A biopic tracing the romance between poet Elizabeth Bishop (Miranda Otto) and architect Lota de Macedo Soares (Glória Pires), Reaching for the Moon boasts some fantastic central performances. Otto plays Elizabeth, the terminally shy young woman who is apprehensive about coming out as a poet, not to mention lesbian. When she goes to stay with her friend from college, Mary (Tracy Middendorf), she’s taken aback by Mary’s lover, Lota. A coolly confident woman, she takes an initial dislike to Elizabeth, whom she sees as a bit of a wallflower. However, a bond forms between the two of them and romance soon follows. Set in Brazil in the 1950s, Reaching for the Moon moves at a languid pace, but never becomes boring. Its greatest assets are the central three actresses. Their personalities contrast, clash and complement each other perfectly. Otto proves yet again that she should have the lead role in more feature films, whilst Pires’ approach to Lota seems so gloriously effortless. Finally, there is Middendorf, whose character unfortunately gets sidelined for the second half of the film. The best moments are those when all three are onscreen, so it’s disappointing that we see less and less of her as the film goes on. Finally, we have the inexorable Treat Williams, who has to be one of hardest working actors ever. The location scenes are gorgeous, and Soares’ retreat in what looks to be the middle of the Brazilian jungle is beautiful. The film obviously didn’t have too much money to throw around, but the visual effects successfully take us back in time. The film overstays its welcome somewhat, and is a little heavy-handed when it comes to symbolism. I do, however, appreciate it for the fact that it tells the type of story we don’t often see on the big screen, and it would certainly pass the Bechdel Test with flying colours. I generally don’t enjoy biopics, but Reaching for the Moon worked for me. Whilst is alludes to Elizabeth’s childhood, it doesn’t fall into the trap of following her life story from beginning to end. The familiar beats of the genre are here, however, including the childhood episode that would shape the woman she’d become. The references to the political situation in Brazil at the time tended to go over my head, but they’re not so important as to side-track the narrative. A solid piece of filmmaking with three fantastic actresses, Reaching for the Moon is a quiet achiever. This entry was posted in Film Reviews and tagged Biopic, Drama, Period Drama, Romance by Stuart Wilson. Bookmark the permalink.